There is no shot more loved by fans and loathed by players than the jump shot. It used to be that the best players had to have a solid education in kicking their way out of safeties. These days everyone just busts out a jump cue to get out of trouble. When I was learning the game from my mentor, he took me to play three cushion billiards every week for almost a year to teach me all of the subtleties in the art of kicking. It was a torturous year, but it gave me a distinct advantage over the players who could not kick a ball. Not long after, almost everyone had a jump cue in their case. At first I resisted the trend because of my kicking knowledge, but in the end, sometimes it's just the right shot. One of the questions I am frequently asked is how to jump the ball. If you're having a failure to launch, here are a few tips for a smoother takeoff. 1. Align a jump shot the same way you would a regular shot. Stand behind your shot and line it up. Step into the line of aim. 2. Use the proper elevation for the shot. A general rule is angle in equals angle out, so the closer your cueball is to the obstructing ball the more elevation you need. 3. Cue up to center ball or above. Jump shots work like all other shots. Hit them high and the cueball will follow, hit them low (in this case low is around center ball) and the cueball will draw. 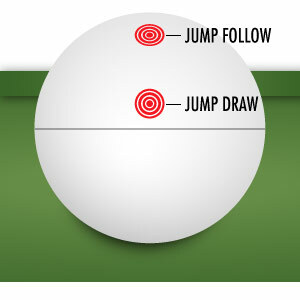 As you get more advanced you can use left and right spin, but the aim requires a lot of practice. Elevate your cue at least 30° for jumping. Remember, angle in equals angle out. Frank Says: "Don't own the right cue for attempting jump shots? Then you have to try the Venom Trickshots Jump Cue, it's perfect for those types of shots!" 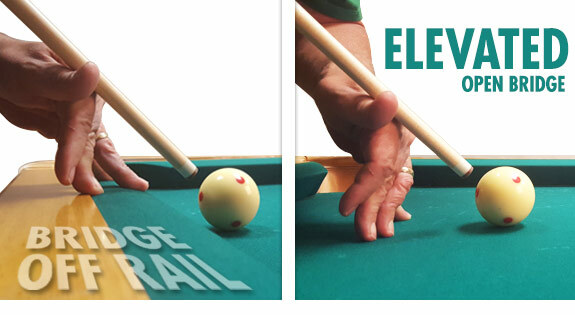 Depending on cue ball position, utilize the bridge on rail or the elevated open bridge hand. 5. The second most important part of a jump shot is to lift your elbow up high, and lock it in place. Many players bend forward and get their face closer to the cueball to get their elbow up nice and high. 6. The most important part of a jump shot is to keep the elbow high on your follow through. The stroke should be a sharp pop generated only by the swing of the forearm. If your ball is not jumping, the most likely culprit is that you are dropping your elbow on the follow through. Lock your shoulder in place. These six things will definitely make you better at jump shots, but I am still going to encourage you to learn how to kick. Kicking is one of the most complex and beautiful parts of the game, and when it is done well, the real pool players will take notice. Also, at higher levels of the game safety play is a lot tighter, and jump shots are frequently not possible. Remember, the right shot is not always the easiest one, so please jump responsibly.